As editor of the Council Report VII: On Green Architecture and Urbanism, I am pleased to announce that the publication has been printed and is now available for order. Green building today is well-defined and increasingly popular. However, green urbanism is only starting to coalesce as a defined or systematized approach to the built environment. The Council Report VII features 21 articles on sustainable construction and placemaking by leading practitioners of new urbanist design, planning and education. What are the best principles and techniques now being developed to coordinate sustainability measures and functional urban design? What are the advanced tools now being developed by urban designers to code and build sustainable urbanism? How are firms redefining themselves to focus on sustainability as a foundation of their practice? What lessons are offered by leading examples of sustainability policies, built projects, and plans? What are effective guidelines for communicating and marketing sustainable communities? What are the definitions of sustainable urbanism, and how do we measure or quantify it? What is research telling us about the sustainability of traditional architectural design and construction techniques, and their performance relative to modernist styles? How are universities incorporating sustainable urbanism, and what programs and initiatives are now underway? What are the philosophical underpinnings of green urbanism and what are the proposed agendas for future research and advocacy? In the extended entry, a complete table of contents and a summary of each article. 1. “Good News Bad News” by John Massengale, principal of John Montague Massengale AIA Architecture & Urbanism and organizer of the Green Council. Massengale offers some thoughts on the personal dimension of the post-carbon future and lifestyle. 2. “Green Urbanism and the Long View” by Hank Dittmar, chief executive of the Prince’s Foundation for the Built Environment and chairman of the Congress for the New Urbanism (CNU). Dittmar discusses coordination between sustainability techniques and neighborhood- and regional-scale urban design, drawing on Stewart Brand’s book “How Buildings Learn” for a framework of principles. 3. “Canons of Sustainable Architecture and Urbanism” by Elizabeth Moule and Stephanos Polyzoides, principals of Moule & Polyzoides, Architects and Urbanists and co-founders of the CNU, and Hank Dittmar. The Canons document is a companion to the CNU Charter. 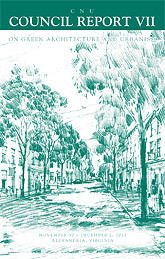 It “sets out a series of comprehensive principles that address sustainability as it applies to each of the components of urbanism.” A .pdf of the document is available from the Moule and Polyzoides website. 4. “The Green Mile: Aligning Firm Ideology With Sustainability” by Thomas E. Gallas, principal of Torti Gallas and Partners. Gallas recounts the journey his firm has made toward sustainable design, including discourse sessions, strategy games, green specs, client partnerships and the firm’s new design charter. 5. “A Convenient Remedy to the Inconvenient Truth” by John Norquist, president and CEO of the CNU. Norquist makes a concise argument for new urbanism as an important solution to the threat of climate change. 6. “The Marketing of Sustainable Communities” by Andrés Duany, principal of DPZ and co-founder of the CNU. Duany offers a one-page chart that summarizes his approach to green market segments. Duany previously discussed some of these ideas in a Time magazine podcast (starts at 15:30). 7. “Planning Sustainably — Without a Crystal Ball” by Stephen Coyle, principal of Town Green Studios. Coyle presents four principles of sustainable planning that have proven themselves over time and may be used to evaluate proposed solutions. 8. “A New Culture in Building” by Ben Bolgar, director of design theory & networks at the Prince’s Foundation for the Built Environment. Bolgar describes recent construction research undertaken by the Prince’s Foundation, developing and testing solid, simple and organic wall structures with high thermal performance. 9. “Sustainability and Traditional Architecture” by Robert Adam, principal of Robert Adam Architects. Adam reviews the results of research performed by a consortium that his firm organized, which showed traditional buildings to be more energy-efficient and sustainable than modernist-style glass-wall buildings. The research was briefly covered by the Daily Telegraph in Traditional buildings ‘more eco-friendly’. 10. “Proposed Research and Development Priorities for the Long Emergency” by Michael Mehaffy, principal of Structura Naturalis Inc.
Mehaffy outlines an ambitious new urban agenda for research, partnerships, and the development of new theories and methods that will carry sustainable urban design into the 21st century and beyond. 11. “Sustainable Urbanism” and “LEED for Neighborhood Development” by Douglas Farr, principal of Farr Associates and CNU board member. Farr was the subject of a profile in the Nov/Dec 2007 issue of New Towns. Excerpts from Farr’s book Sustainable Urbanism cover the methods and goals of the book, sustainable neighborhood and corridor diagrams, a summary of the LEED-ND rating system, and details of the 2030 Community Challenge. 12. “Viva Cities!” by Harriet Tregoning, director of the DC Office of Planning and Zach Dobelbower, city staff planner. The authors review a plethora of official programs, plans, initiatives and accomplishments that have redefined Washington D.C. as a sustainable city. 13. “Sherford” by Paul Murrain, urban design consultant and former senior design director for The Prince’s Foundation. Murrain details the planning, design and coding of a new urban extension in Devon, which has been rated as one of the most sustainable and environmentally responsible developments in the U.K.
14. “All Green is Not Good: Sustainability by the Transect” by Sandy Sorlien, editor of the SmartCode. Sorlien discusses how applying sustainability techniques to neighborhood and regional-scale urban design can lead to negative consequences when a coordinating, principle-based framework is absent. The Transect provides that framework and the SmartCode makes it operational, with plug-in modules for stream buffers, drainage, hazard mitigation, energy production, local food growing, recycling and more. 15. “Light Imprint: Integrating Sustainability With New Urbanism” by Thomas E. Low, director of the DPZ Charlotte regional office. Low discusses the Light Imprint initiative, a comprehensive, sustainable approach to stormwater, drainage, pavement and landscaping in the new urban context. Low presents a case study comparing conventional TND design with Light Impact design, finding that the latter results in better ecological performance and lower costs. 16. “The New Urbanism Ark: A New Environmental Module for the SmartCode” by Jaime Correa, professor and principal of Jaime Correa and Associates. Correa was the subject of a profile in the Oct 2007 issue of New Towns. Correa ranges through the philosophical foundations of urban design, identifying necessary principles and the primacy of art. Correa’s SmartCode modules for solar energy, wind energy and food production are also discussed. 17. “Why We Teach Classical and Traditional Architecture and Urbanism” by Michael Lykoudis, dean of the University of Notre Dame School of Architecture. Lykoudis was the subject of a profile in the Mar/Apr 2008 issue of New Towns. Lykoudis covers the fundamental reasons why traditional construction, architecture and urbanism methods are inherently the most environmentally and culturally sustainable. 18. “A Snapshot on the Status of Architectural and Urban Design in 2007” by Ellen Dunham-Jones, director of the Architecture Program at the Georgia Institute of Technology and CNU board member. Dunham-Jones reports on the current perceptions, trends and activities related to sustainable urban design education, spotlighting Georgia Tech in particular. The numerous challenges to further progress are outlined, as well as thoughts on how CNU members can help and collaborate with universities. 19. “Green on Green” by Elizabeth Plater-Zyberk, dean of the University of Miami School of Architecture, principal of DPZ and co-founder of the CNU. Plater-Zyberk discusses specific examples of how sustainability concerns are integrated into the UM curriculum. Plater-Zyberk goes on to discuss five points for the reform of architectural education, drawn from her framework outlined in the book Windsor Forum on Design Education, and recast with a focus of sustainability. 20. “Green Shouldn’t Mean Science Fiction — A View from Great Britain” by Ben Pentreath, principal of Working Group Design. Pentreath describes the activities of his firm and collaborations, which illustrate how traditional architecture can have environmental performance equal to or better that modernist styles, while also costing less to build and gaining greater acceptance in the marketplace. 21. “Original Green” by Steve Mouzon, principal of the New Urban Guild LLC. Mouzon outlines the eight principles of sustainable places and sustainable buildings that make up Original Green. Mouzon explains why living traditions that span long periods of time are superior “delivery devices” for sustainability. The Green Architecture and Urbanism Council, held November 30 – December 2, 2007 in Alexandria, VA.